This particular entry deserves mention because I'm posting this after I ate the dish thrice at Thai Express, albeit at different branches. With Oomphatico's, Siam Kitchen and a couple of other food courts lined up, it's amazing to think that I actually ate Phad Thai at least seven times within a single month. The reason why Thai Express' Phad Thai is slightly better than Oomphatico's is because of its seafood, and also for the fact that it is marginally less oily. The picture above is taken from the Viocity outlet, which came slightly wetter as compared to the ones I ate at Holland Village and Raffles City. Nonetheless, Thai Express has managed to maintain a general sense of consistency that got me back to the place for the third time. People who have tasted those sort of roadside stalls in Bangkok may contest with this rating, and I admit that the Phad Thai in Singapore (at least the ones I've tasted thus far) lacks the taste similar to the traditional "wok hey" (the often elusive hawker taste that is difficult to replicate in other conditions) of dishes like char kuay teow. 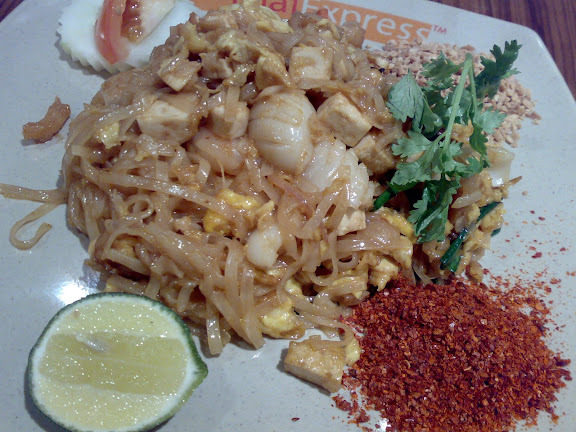 Still, if it's anything to go by, the Phad Thai from Thai Express is good. Comparatively, Siam Kitchen's Phad Thai is horrible, especially since it tastes like a lot of ketchup (!!) was being used. The latter however can still be visited for its ala carte dishes. Just a peek from the entrance will give you a sense of awe and delight, especially for the ladies since it's all washed in soft pink and white. I've noticed a lot of first-time customers going "Ooh, it's so pretty!" and I've got to agree too. What is striking about this place is it's style - a comfy yet equally presentable interior, a very strong service personality, and a culture of fun, tease and promise of good food. This restaurant is popular with expats, with adorable kids roaming around the place and the staff (probably from experience) skilfully dodging the little ones. So what about the food you say? The menu is very creatively prepared, and features a unique mix (but not fusion) of Italian and Thai food. So as far as you've got your Cabonara pasta, you've got your Phad Thai as well, while risottos go head to head with pineapple fried rice. Take your pick, here's what we had. I've been on a Phad Thai hunt ever since my trip to Bangkok, and even in Singapore I've gone on to try those at Thai Express, Siam Kitchen, Lerk Thai, and then some. The Phad Thai at Oomphatico's is one of the best ones I've tried here in Singapore, and resembles Nooddi's in Bangkok. The crunch of the peanuts and the spiciness from the chilli makes this a very delightful dish indeed. Service here is excellent. Everyone is smiling, and the staff here is patient, friendly and very polite. $14.90 for the phad thai, $14.00 for the sandwich. ++ as usual. In Toa Payoh Central, there's three plus one main food courts - Kopitiam near the library, Fork & Spoon opposite Courts and Koufu at HDB Hub. The "plus one" refers to the basement food court at HDB Hub, just under the MacDonald's, though it has very short opening hours and caters largely to the working crowd (the rojak is particularly famous here, and it IS very good indeed). Lunch today was at Koufu. The vegetarian food here is pretty alright and affordable too, which explains why I bumped the score to a 7 despite a taste rating of 6.7. Granted, I only ate fried noodles, mock char siew and tofu, but still it tasted acceptable by a vegetarian stall's standards. I paid $3.50 for this, cheap! Daphne ordered this first, which looked good and got me to head to the vegetarian stall to get noodles too (if you hadn't known, I don't eat pork). She got some fried yam thing (which she initially thought was fried ngor hiang till she tasted it), and two variants of fish cakes. The yam thing didn't go down very well but she liked the other two sides. Comparatively though, this was more expensive than mine - hers cost $5. 1. I've tried the "Thai" food next to the Japanese food. It isn't worth a try. 2. There's no Halal food in this food court, but there's a Malay cuisine stall that claims to have "no pork, no lard". If you have not tried Beard Papa's cream puffs, shame on you! They're the yummiest cream puffs I've ever tasted, and they're not too pricey too. I will always get the Cookie Choux which is really like the standard cream puff that Beard Papa sells only that it's hard and crispy on the outside. Which means you have a fantastic mix of crisp outer layering and smooth (sooooo smooth) cream custard that spills out whenever you sink your teeth into it. Ahhhhh, the thought of it is setting off another craving. Here's a closer look at the cream custard. It's more than what you see here of course. $2.50 each for chocolate or vanilla filling, $2.80 for strawberry. The usual promotion is Buy 5 Get 1 Free. Also: Takashimaya B1 Food Hall, Bugis Junction B1-12A, Vivocity B2-K14, Plaza Singapura B2-K58. For now, me and Daphne visited Big O at Wheelock some time ago for dessert, and the cakes here are really worth a mention simply because they're so sweet, rich and good that it gets you on a high. Even if that's for a fleeting short while, it's still good stuff. I ordered this for two reasons. The first is really the name (see my blog?) and the second is because it's supposed to be chocolatey-rich. Indeed, this cake was so awfully thick with chocolate cream, bits, powder, and yes cake, though you may find milk chocolate clashing with bitter chocolate on some chews and bites. Still, I really liked this cake, though it was very filling and after going past two-thirds of it, the rest was pretty much pushing it down. 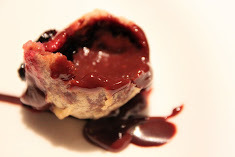 Daphne had this, and boy was it good. Great mix of smooth chocolate mousse and soft cheesecake. Good, though the manager wasn't as friendly as the staff, and explained so smile-lessly that no reservations can be made on weekends. Close to $8 each including GST. Big O is actually a sister company of NYDC.